High blood pressure is a medical condition resulting in increased blood pressure in the arteries. Almost one billion people worldwide suffer from high blood pressure, which is also known as hypertension and arterial hypertension. High blood pressure is diagnosed by comparing two different measurements of the patient’s blood pressure. By comparing the range of these readings, doctors can see if a patient’s blood pressure is elevated or within the normal range. Because high blood pressure is such a common medical condition, it’s important to have easy access to information about the symptoms of high blood pressure, today’s most effective treatments and blood pressure management options. We aim to provide an in-depth, detailed and helpful resource for people that believe they may have high blood pressure who are interested in learning more about it and people who have high blood pressure seeking treatment and management options. In this section of our website, you’ll be able to access detailed information on high blood pressure. Learn about the symptoms of high blood pressure, the effects high blood pressure can have on your health and more. Whether you would like to learn more about the signs and symptoms of high blood pressure or want detailed information on high blood pressure medication, our High Blood Pressure Information section will help you find the answers you need. It’s possible to manage your high blood pressure and bring it to within a healthier range by making some changes to your diet and lifestyle. In our Lower Your Blood Pressure section, you’ll find detailed guides to lowering your blood pressure. Whether your blood pressure is on the high side of normal or significantly above the normal level, this section will help you learn safe, effective and proven strategies for reducing your blood pressure and living a healthier life. High blood pressure is a common health condition, and new developments continue to make managing it simpler. Stay up to date with the latest news and developments on high blood pressure with our blog. Can Whiplash Cause High Blood Pressure? Evidence is suggesting that neck problems, the position where the neck meets the head could have a direct link to high blood pressure. High blood pressure is quite common, it is estimated that over 1 in 4 people in the UK suffer with high blood pressure, it is most frequently controlled through medicine. High blood pressure also known as hypertension can have a variety of causes, those who suffer with blood pressure problems can do so for different reasons. Very often high blood pressure can go unnoticed until your blood pressure is actually taken as there may be no visible signs. There is no denying that if high blood pressure is not diagnosed it can lead to other serious problems, and sometimes may cause a stroke. Blood pressure refers to how effective the blood is at pumping around a person’s body. When blood pressure is taken two reading will be recorded, the systolic pressure, which illustrates the force in which the heart is working to get the blood around the body, the second number diastolic pressure, which is concerned with the blood vessels. Those who suffer with high blood pressure are at risk for very serious illnesses, high blood pressure can very easily cause, heart disease, heart attacks, strokes, heart failure, but to name a few. It is very important that blood pressure is controlled especially if it is at the high end of the scale. If the vertebrae are misaligned then this can have a heavy bearing on a person’s blood pressure. The upper part of the vertebrae where the heads meets the neck can have a significant effect on a person’s blood pressure if any part of the structure is out of place. It is possible that a stiff neck can in fact be a cause of high blood pressure, simply putting this right can mean that high blood pressure may be lowered. There is a very real reality that whiplash may be a cause of high blood pressure. Chiropractors have reported that by manipulating the neck muscle it has made a clear difference to those who suffer with blood pressure problems. If you have been a victim of whiplash and your blood pressure has increased you may be able to make a claim for compensation. Whiplash can happen in a range of circumstances, it most commonly happens as a result of a road traffic accident or a sudden impact incident however accidents that happen every day can also cause whiplash. Although whiplash is a common type of injury it can have serious effects. It usually occurs when the neck suffers rapid movement, forcing the head back and forth with little or no control. Depending of the velocity of the impact can largely depend on the severity of the whiplash. In the instance of a road traffic accident when the vehicle collides with another or even an object it forces those within the vehicle to move suddenly completely stretching and tearing tendons and muscles in the neck and back. Have you recently suffered from a Whiplash Injury? If you have suffered from a whiplash injury due to a car accident or road traffic accident it is important that you claim compensation as you might need medical treatment and that can be expensive depending on your injuries. You can also find out how to claim for whiplash compensation? and that way you are covered for medical expenses. There is a lot of very interesting information and investigations being done regarding neck pain and its connection to high blood pressure. Chiropractors have for some time now made the connection, those who suffer with neck pain may also be suffering with high blood pressure. Through manipulation of the neck muscles, chiropractors have been known to lower a patient’s blood pressure. The University of Leeds, lead by professor Jim Deuchars, have examined how it is possible to lower blood pressure through ‘cracking’ the neck muscles of those who suffer with neck pain and neck problems. Astonishingly neck muscles can play a vital role not only in a person’s blood pressure but also their breathing and heart rate. By controlling or even curing a person’s neck pain can lower their blood pressure if they suffer with high blood pressure. For quite a while professionals were never really sure why manipulating stiffness in the neck lowered high blood pressure. The study from Leeds University illustrates how nerves can be responsible for carrying the blood supply to the brain, where these signals fail can mean a change in a person’s blood pressure. There is a clear connection between those who suffer whiplash and then go on to acquire high blood pressure. When the neck becomes injured through a whiplash injury then it is likely that the nerves can no longer transmit relevant information for the blood to flow sufficiently causing high blood pressure. The research is continuous as there are thought to be other problems that can be caused through a whiplash injury. Whiplash symptoms do not always appear or affect a person straight away, they can take a series of hours even a couple of days to fully surface. Symptoms of whiplash can vary from person to person, it usually starts with neck stiffness, pain will increase with any movement of the head and neck. Whiplash is not just concentrated on the neck area it can very easily affect the shoulder region causing pain that runs across the top of the back causing motion and movement problems in the arms, as well as pains in the back. Headaches are largely associated with whiplash, they are mostly based in the bottom part of the head near the neck. It is always important when involved in any accident including a road traffic accident and feel pain in the head, neck or back region to seek medical advice in order to rule out anything serious. Any sudden impact can cause internal damage that cannot be visible. Very often the doctor can do simple tests to discover if the pain you are feeling is whiplash, in more serious cases where the pain is so severe it may be important to have more invasive tests, diagnostic tests that can rule out any permanent damage. 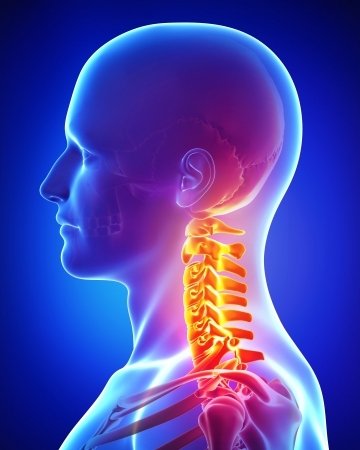 There is no actual required treatment or medication for whiplash, often doctors just advise to carry on as normal to try and mobilise the neck muscles again. Painkillers are often needed in the initial stages as in some cases the whiplash cab be severe and very painful. Physiotherapy may be required if movement continues to be restricted, and pain is present when trying to move and turn the neck. Most cases of whiplash will improve on its own and a full recovery is usually expected. For more information on whiplash visit this NHS whiplash page.